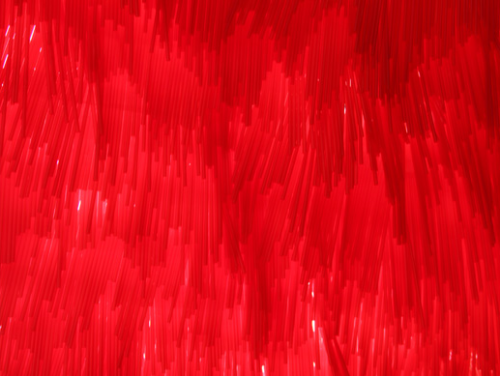 Rarely do red plastic coffee stirrers conjure notions of Walden Pond, but for architect Brian Ripel and artist Jean Shin, the notion is not that far fetched. The duo’s Tea House rooftop installation at the deCordova Sculpture Park and Museum in Lincoln, Massachusetts sits about a mile from Thoreau’s retreat. Ripel pointed out that the connection is somewhat difficult to discern in isolation, but the gabled pavilion frames pristine views absent of any evidence that the museum sits a mere twelve miles from downtown Boston. Thousands of tea stirrers make up the canopy. While the project took two years to conceive and engineer, construction took only three months. 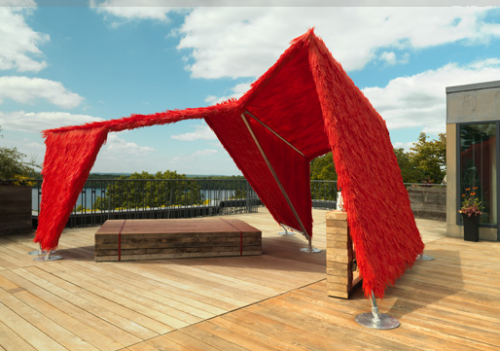 The thatch-like canopy is made up of 12 by 24 inch shingles of stirrers sewn together with an industrial sewing machine. Approximately 250,000 stirrers make up the shaggy shelter. The aluminum frame mimics the gables of nearby rooftops and re-purposed lumber was used for the tea bar and seating plinth. Visitors will be served free tea and the discarded teabags will be used in the second component of the exhibition that opens in the fall. The teabags will form hanging chain models for an installation called Retreat that will remain on view through the end of the year. 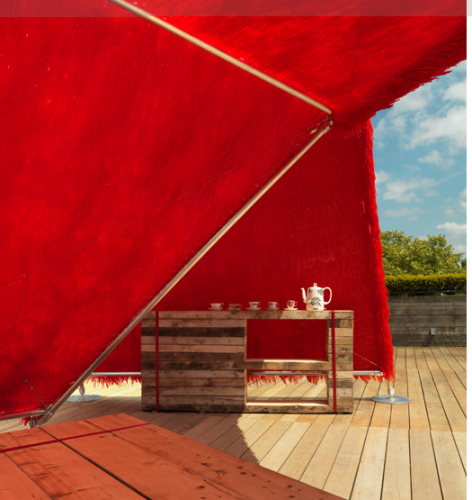 The tea pavilion uses recycled materials from old teacups to the timber for used for the seating plinth and tea bar.